A real pleasure, attentive staff and wonderful food. A visit to remember. It was the perfect palace for a reunion of friends. Very friendly and helpful staff. Would certainly return. Wales is a country in the United Kingdom. Wales consists of three regions which are divided by the mountain range in central Wales: North Wales, Mid Wales and South Wales. Wales is famous for its picturesque towns, including Cardiff, Conwy, Swansea, Caernarfon and Aberystwyth. Cardiff International Airport (CWL) connects Wales to the rest of the UK and destinations in Europe and the rest of the world. There are numerous festivals held in Wales each year, such as the famous Eisteddfod in August. The Travellers Guide has a selection of comfortable hotels, guest houses and bed & breakfast accommodation in Wales, listed below. Please view our hotel offers page for the latest "early booking", "spa break" and "free night" special offers for a range of hotels in Wales. The Ramada Plaza Wrexham is a contemporary hotel set in the centre of Wrexham with its bars, restaurants and live music venues. 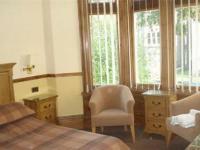 It is eight miles from the Roman city of Chester with its historical landmarks and race course. Manchester International Airport is an approximate driving time to of 45 minutes from the hotel, and a distance of 38 miles. Hotel Features. These apartments with a full kitchen and free parking are a 2-minute walk from Cardiff's famous Queen Street shopping area and Capital Shopping Centre. Just 10 minutes' walk from Cardiff Castle, The Regan Lodge offers free parking, cosy bedrooms and free Wi-Fi. 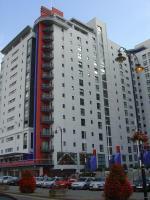 The Millennium Stadium is a 15-minute walk away. A 2-minute drive to Cardiff city centre, Acityabode @ Century Wharf provide contemporary apartments, just a 5-minute walk from the bars and restaurants of Mermaid Quay. With free Wi-Fi and a 24-hour front desk, The Riverhouse Backpackers sits on the banks of the River Taff, with views of the Millennium Stadium. The eco-friendly hostel has free Wi-Fi. The boutique-style hostel offers budget bedrooms and dormitories. St George's Hotel is located on the seafront in Llandudno, Wales, 700 metres from the Great Orme Tramway and 800 metres from Llandudno train station and the Alice in Wonderland Centre. Bodafon Farm Park is 1.5 miles away, and Conwy castle is four miles from the hotel. Hotel Features. 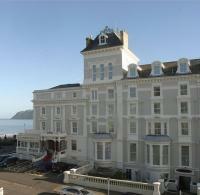 A Victorian seafront property, St George's Hotel features a distinctive tower and period interiors. Situated between the Millennium Stadium and Cardiff Castle, this hotel is a perfect base for business and leisure guests, following its extensive refurbishment completed in January 2008. Copthorne Cardiff Caerdydd hotel in Cardiff is a modern hotel and enjoys a picturesque lakeside setting four miles from Cardiff Castle and Bay. The 135 guestrooms feature contemporary decor with richly coloured fabrics, dark wood furnishings, cable TV with pay movies, and direct dial phones. Bathrooms have showers, complimentary toiletries, and hair dryers. The Barceló Cardiff Angel Hotel is located in Cardiff, Wales, 200 metres from the city's central market, and 1.5 miles from Cardiff Bay. Cardiff railway station is 500 metres away. Hotel Features. Set in a classical building with an elegant facade and pillared lobby, the Paramount Angel Hotel offers wireless Internet access, a 24 hour front desk, and room service around the clock. The Gliffaes Country House Hotel is located in Crickhowell, Wales, in the Brecon Beacons National Park, 10 miles from Abergavenny town and train station, and 20 miles from annual literary festival at Hay on Wye. Hotel Features. This family run country house hotel is set in 35 acres of tree lined grounds overlooking the River Usk. Guests can ask the concierge to help organise sightseeing and book tickets to shows attractions.